Boogong in Googong celebrates Halloween this weekend. Photo: Lightbulb Studio. Both the Canberra International Film Festival and the SpringOUT Festival are starting this weekend. The Canberra Nara Candle Festival is also on, and Googong is celebrating Halloween with its very popular Boogong event. The Rugby League World Cup is coming to town, and the National Library is celebrating 50 years of Picnic at Hanging Rock by asking: “where’s Miranda?” The ACT Services are having an open day, Girl Guides are celebrating 90 years of being in Canberra and the Canberra Montessori School is having it’s Spring Fete this Saturday between 9 am – 2 pm, Mulley Street, Holder. The Canberra International Film Festival starts this weekend, and it’s curated program includes both retrospective and contemporary films from around the world. The program emphasises new films from Australia and Asia, as well as providing a platform for Canberra filmmakers. The Festival’s retrospective program will celebrate the work of Googie Withers—on the centenary of her birth—showing two of her films: It Always Rains on Sunday (1947) and White Corridors (1951). Googie was a major star of British cinema in the 1940s before migrating to Australia in 1958 where she became a prominent theatre actor until her late 80s. The retrospective program will also highlight the work of Jacques Tourneur, a French director from the 1940s and 50s who specialised in low-budget supernatural thrillers and intense psychological dramas. Two of his films: Anne of the Indies (1951) and Out of the Past (1946) will be shown. The Festival’s contemporary program will feature prize-winning films from the Cannes and Berlin Festivals including The Square, an irreverent Swedish comedy about the art world starring Elizabeth Moss. The last Friday in October is traditionally when women march through Garema Place and Civic to Reclaim the Night. They do this to raise awareness of sexual violence and the fact that many people don’t feel safe in public spaces. This year the march will feature performances by Matilda Rose, the National Busking Champion; and dancers from Ghawazee Moon Bellydance school. The Girl Guides are celebrating 90 years of being in Canberra. They invite you to join them on the shore of Lake Burley Griffin where there will be will be a mobile rock climbing wall, face painting, a sausage sizzle, campfire fun, a jumping castle and Girl Guide biscuits! The SpringOUT festival starts this weekend and it kicks off with the AIDS Action Council of the ACT’s Fair Day. SpringOUT is Canberra’s official queer cultural festival that affirms the pride, joy, dignity and identity of Canberra’s LGBTIQ (lesbian, gay, bisexual, transgender, intersex and queer) communities. The festival runs from this Saturday until 26 November with events including Queerberra, an exhibition of local photographer, Jane Duongat’s work at East Hotel; The Dykeside comedy events at the Polit Bar; Question Time with Andrew Barr and lunch with Benjamin Law at Muse; a Will and Grace trivia night at the Hellenic Club; and many other talks, parties, dances and activities. Check here for a list of events. 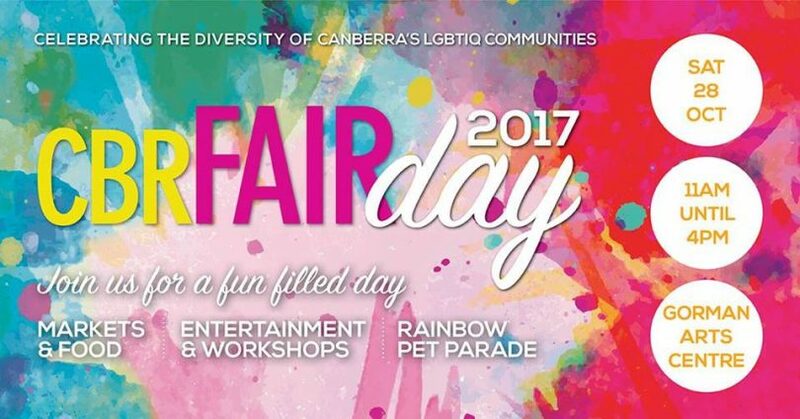 Fair Day will give you an opportunity to meet the organisations and groups that support Canberra’s LGBTIQ communities while eating some fabulous food and enjoying the entertainment. There will also be some important community research being undertaken at the fair including data collection for the Snapshot Lesbian and Bisexual Women’s Survey and the Canberra Gay Community Periodic Survey. 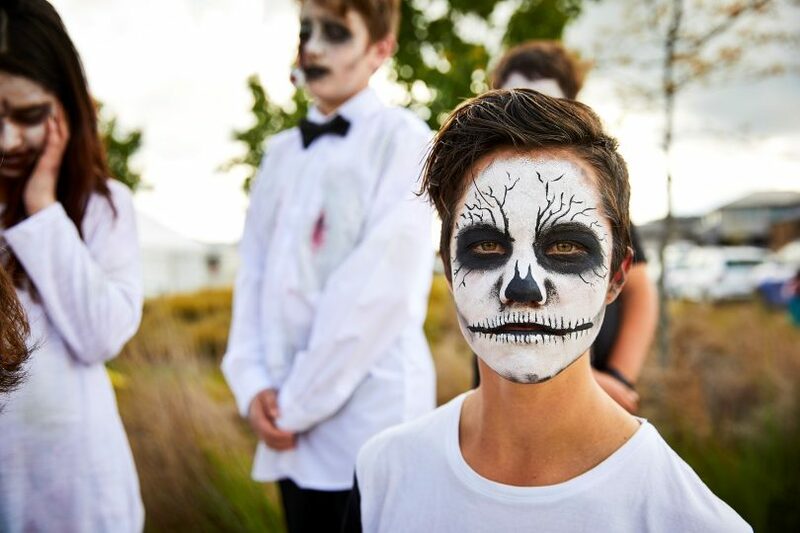 Head to Googong for a massive Halloween street party this Saturday. The town is setting up a giant marquee with an eerie light show, oversized spiders and food stalls. Spooky circus performers will be wandering around, and there will live music throughout the night. If you want to get up close and personal with a monster, there will be a demon kissing-booth; or take a selfie in front of the warped mirrors. This annual event is fast gaining a following with over 15,000 people attending last year. To get there, follow the signs along Googong Road to the abandoned wool-shed. The night will finish with fireworks at 9 pm. Lennox Gardens will be lit up this Saturday night with 2000 shimmering candles. It is the 15th annual Canberra Nara Candle Festival, a celebration of our Sister City relationship with Nara, Japan. There will be Japanese food, markets, stalls and activities, and an amazing program of entertainment including musicians William Barton on didgeridoo, Slava Grigoryan on guitar, and Riley Lee on shakuhachi. Try your hand at Japanese drumming, origami, or ikebana (Japanese flower arranging); make a lantern or fly a kite. Check out the program here. The National Library is celebrating the 50th anniversary of Joan Lindsay’s cult classic Picnic at Hanging Rock. Join Genevieve Jacobs as she MCs this event which includes discussions about the book and its legacy, and dramatised readings from the novel performed by a stellar cast of Australian actors including Taylor Ferguson, Marcus Graham and Robert Menzies. Tickets are $20 and include an English-themed afternoon tea, book here. The ACT Emergency Services are having an Open Day this Sunday, giving you the opportunity to meet the people who keep you safe and learn what you can do to prepare for and respond to an emergency. There will be helicopters, fire trucks, a fire-fighting demonstration, food stalls and plenty of entertainment for kids, including face painting, a petting zoo and a jumping castle. The Rugby League World Cup starts this weekend. It is being played in Australia, New Zealand and Papua New Guinea and involves 14 teams, playing 28 games over five weeks all hoping to win the Paul Barrière Trophy. This Sunday, France is playing Lebanon at the Canberra Stadium, book tickets here.